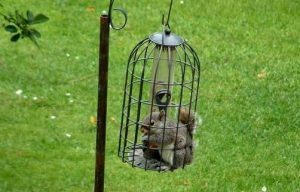 This well-made and potentially useful garden product was advertised and sold as a “squirrel-proof bird feeder” – or was it a “bird-proof squirrel feeder”? This entry was posted in Garden and landscape products, Garden Design and tagged bird feeder, squirrel feeder on 30th September 2008 by Tom Turner. I wish we could have more context-sensitive public art. 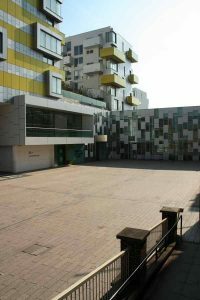 This entry was posted in context-sensitive design, Landscape Architecture, London urban design, Urban Design and tagged Barking Town Square, Muf, public art on 30th September 2008 by Tom Turner. I’d never been to Barking. But in 2008 Barking Town Square won the the 5th European Prize for Urban Public Space so I went to have a look. Sorry about the weak pun, but the judges are Barking Mad. The main building has a sentimental Bauhaus-ey charm but the urban space is a plain rectangle of pink Spanish granite, laid in stretcher bond for no good reason. The hoardings illustrate some planting to come but the “Public Open Space” is a void, an empty space, a nothing. The judges all represent organizations which promote the art of architecture, which is fair enough, because the building is OK, but this is NOT a good urban square. It is as though Jane Jacobs and William H Whyte had never lived. There is no mixed use: the adjoining buildings are all municipal, without the shops and cafes which might have provided users. There is nowhere to sit, ignoring wisdom of Jan Ghel. The ‘square’ is almost a cul-de-sac, ignoring Ed Bacon and Bill Hillier. The paving is non-SUDS. The only redeeming feature is a piece of public art described as a “7 metre high folly [which] recreates a fragment of the imaginary lost past of Barking”. But why re-create an imaginary lost past? Barking had a medieval abbey. Captain Cook was married in a Barking church. Then there is the cultural context. Barking has one of the largest immigrant communities in London, with many from the Punjab and Sub-Saharan Africa – neither of which region is known to admire the Bauhaus. 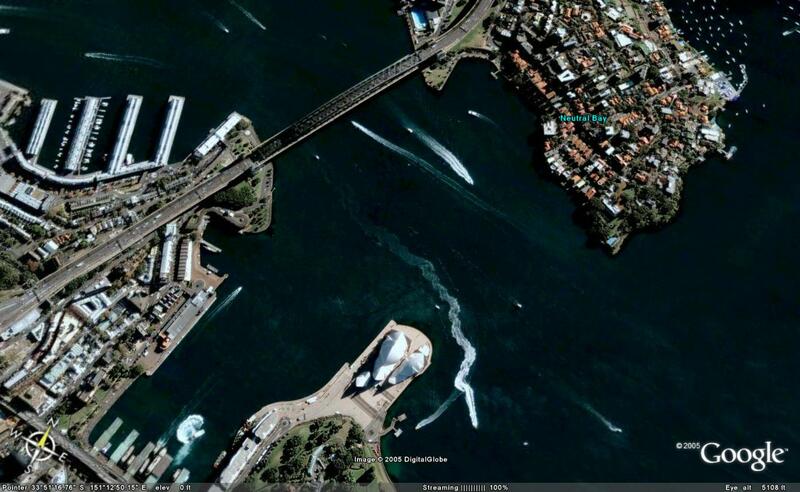 Some architects show genius in urban design. Muf muffed it. Note: The photograph was taken at about 11.30 am on an unseasonably warm autumn day (28th September 2008). The good urban spaces in London were overflowing with people. The places which remind one of pre-1989 East Berlin were empty. 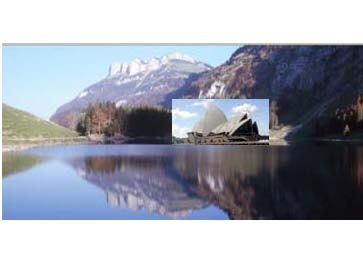 This entry was posted in context-sensitive design, Landscape Architecture, London urban design, Urban Design and tagged context insensitive design on 28th September 2008 by Tom Turner. 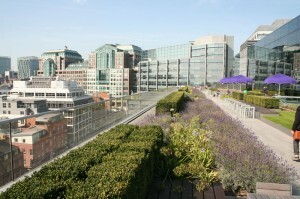 Although the historic and modern medium density London is not visible from Bishops Square in this photograph, Foster thankfully has provided the city with a Landmark building which orientates us within a largely visually undifferentiated urban environment; and the green space and water garden provide the amenity so beloved of London’s inner city squares. This entry was posted in context-sensitive design and tagged Bishop's Square on 28th September 2008 by Christine. This entry was posted in context-sensitive design and tagged heritage, landmarks, New York, Urban Design on 28th September 2008 by Christine. 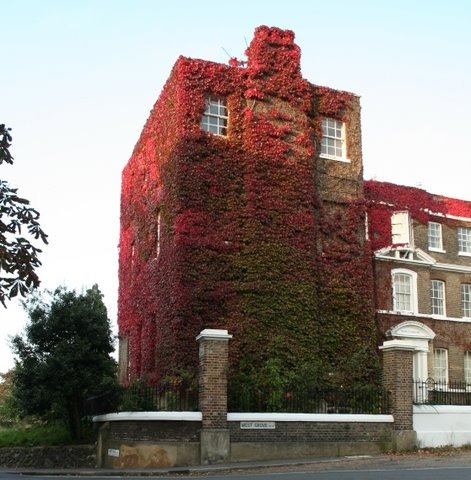 This building is green in summer and red in autumn. It makes a useful contribution to re-balancing the carbon cycle, by absorbing CO2. Undesirable particulates (dust!) stick to leaves and are swept up in autumn. The leaves shield the building from undue solar gain in summer. Traffic noise is absorbed. Birds and insects find habitats amongst the vegetation. It is a beautiful building (Point House facing Blackheath in South London). Why can’t we have more facades treated like this? Call them vertical gardens if it would help. 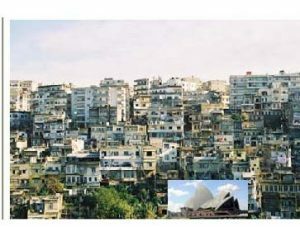 Co-ordinated planting on discordant buildings would harmonize argumentative buildings. 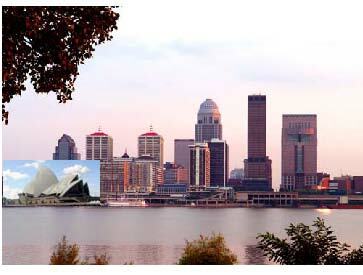 This entry was posted in Sustainable design and tagged green wall, red wall on 26th September 2008 by Tom Turner. 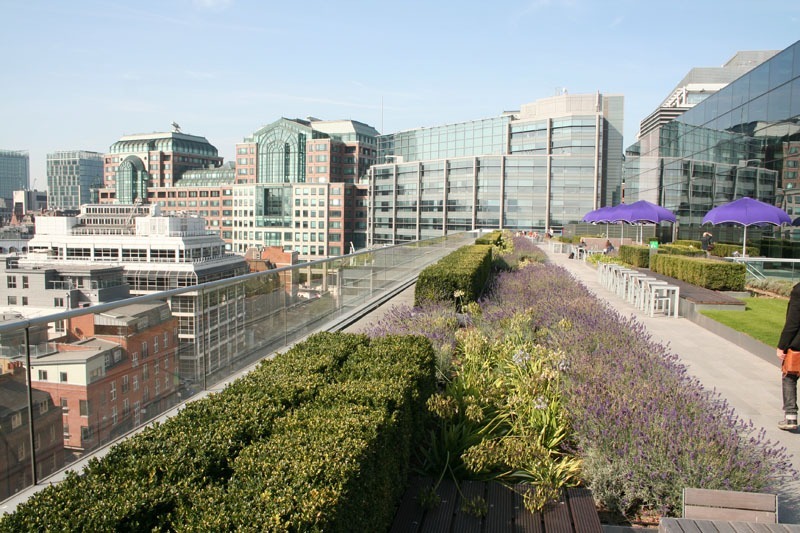 Thank you to Allen & Overy for opening their offices under the Open House scheme – and congratulations to them for having an office with genuinely green credentials. Roof space is used for solar panels, roof gardens or wildlife habitats (brown roofs). As the office brochure remarks ‘One of the best features of Bishops Square is the ability to hold barbecues in the summer or evening drinks on the terrace’. For me, it was a pleasure to see the City taking a small step towards the London equivalent of New York As it Should Be. 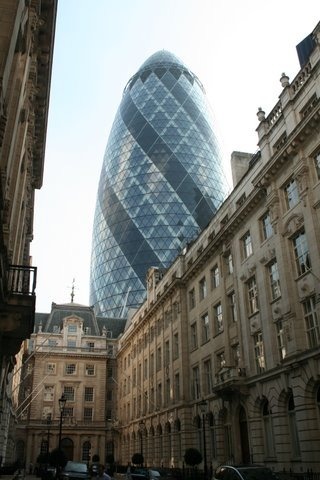 The City should designate its Square Mile as a Green Roof Zone. 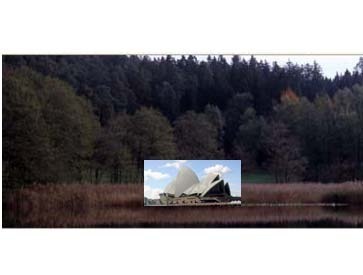 This entry was posted in context-sensitive design, Sustainable Green Roofs and tagged sustainable landscape architecture on 21st September 2008 by Tom Turner. The HQ of the UK Foreign and Commonwealth Office is open this weekend as part of London’s Open House scheme. I came away with two ideas. First, they should treat the Durbar Court as an indoor garden for senior civil servants to tend. It would give them useful experience of the cultural differences between the UK and other countries. Second, they should commission a new building, with gardens inside, outside and on top. Sir George Gilbert Scott’s design, completed shortly after the ‘Indian Mutiny (aka India’s First War of Independence) could then become a Museum of Empire, dedicated to involving visitors in a discussion of the pros and cons of imperialism and globalization. Douglas Hurd, when he was Mrs Thatcher’s Foreign Secretary, used to say that Britain was a country which could ‘punch above its weight’. I wish we could either stop punching or learn to punch well below our weight. This would be a genuinely ethical foreign policy – and a lush display of semi-tropical plants in the Durbar Court would be a step in the right direction. The original design, by Digby Wyatt, had the Court open to the skies, which must have been cold. It is believed that it was glazed over to receive the Sultan of Turkey in 1867. 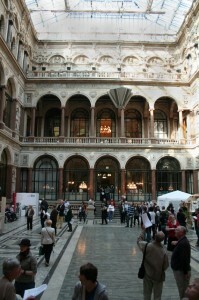 The Durbar Court is now used for receptions and would be a softer and less imperious place if well planted. Or should it remain unplanted in the interests of historical accuracy? 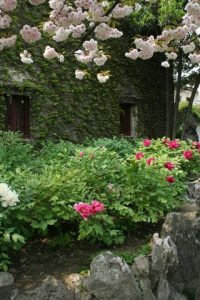 This entry was posted in Garden Design on 20th September 2008 by Tom Turner. As a painter, Roberto Burle Marx was an international abstract expressionist. But as a garden designer and landscape architect he showed a high degree of sensitivity to context – I say ‘surprising’ only because I was so slow to appreciate the complexity of this point. His planting was voluptuously Brazilian, like his mother, and Marx could see no reason for using European plants. Nor did he see any reason for the hard detailing to draw inspiration from the land of his father: Germany. Instead, he drew upon the country whose language is spoken in Brazil. The accompanying photograph is of Copacabana Beach – but could just as well have been taken in Portugal. 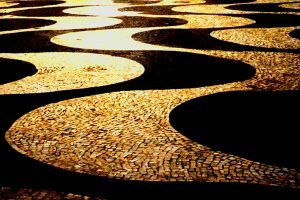 Until I went to Portugal, I thought this amazing design was an example of Burle Marx inventiveness as an abstract painter. I was very wrong. 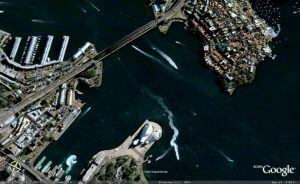 This entry was posted in context-sensitive design, Landscape Architecture, Public parks and tagged abstract modernism, Burle Marx, landscape design on 11th September 2008 by Tom Turner. The sweet birds come there to roost. This entry was posted in Garden Design, Landscape Architecture and tagged Chinese gardens, flowers on 8th September 2008 by Tom Turner. Did Morel, Meason or Olmsted invent the term 'landscape architecture'? A reader makes the following point: ‘On your site you stated that: “The name “landscape architecture” was invented by a Scotsman in 1828’ but, landscape architecture actually originated in France. There, in the year 1804 Jean-Marie Morel introduced; ‘architecte-paysagiste’ in order to distinguish (his profession) garden architecture from landscape architecture.’ There are in fact 3 candidates for the questionable credit of having invented the term landscape architecture: Morel, Meason and Olmsted. Jean-Marie Morel (1728 — 1810) published a book on the Théorie des Jardins (Paris 1776). 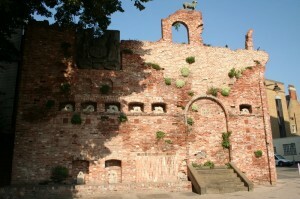 He had trained as an architect and became an advocate of the ‘natural style of landscape gardening’. He worked for Girardin at Ermenonville and, in 1804, coined the term architecte-paysagiste, for which ‘landscape architect’ is a fair translation. Gilbert Laing Meason, a Scotsman, wrote the world’s first book using the English term ‘landscape architecture’. 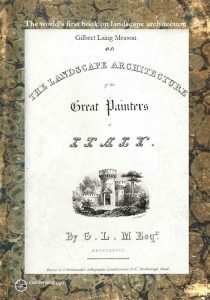 It was published in 1828 and Meason had little interest in gardens. His inspiration came from the great landscape paintings of Italy and the writings of Vitruvius. In combining the nouns landscape and architecture, his concern was for what architects could learn from landscape paintings. The difference between Meason’s and Morel’s terms equates to that between a fish box and a box of fish. 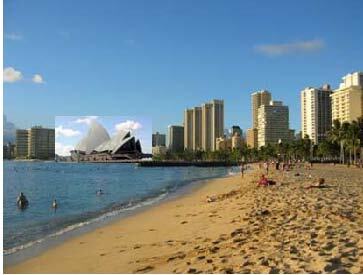 Buildings contribute to containing space; landscapes are the spaces contained by buildings, landform and vegetation. It is a fundamental distinction. Frederick Law Olmsted was the first man to use ‘landscape architect’ as a professional title and one cannot doubt that he learned of the term from his partner, Calvert Vaux, who learned of it from Andrew Jackson Downing, who learned of it from Loudon who learned of it from Meason. I therefore regard Meason as the man who invented the term ‘landscape architecture’ and, despite other respectable claims, Alexander Graham Bell as the man who intented the telephone. This entry was posted in context-sensitive design, Landscape Architecture and tagged Frederick Law Olmsted, Gilbert Laing Meason, Jean-Marie Morel, origin of landscape architecture on 7th September 2008 by Tom Turner. Moore had a deep interest in the siting of his work and often makes me feel a little guilty about reading on trains: he said it was a waste of a wonderful opportunity to observe the landscape. 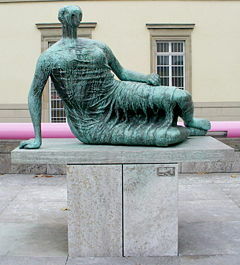 The photograph is of Moore’s bronze “Die Liegende” in Stuttgart (image source: http://en.wikipedia.org/wiki/Henry_Moore). If my memory serves me correctly, I think I heard the architect of a dull paving design for Castleford Town Center say that there were patches of black paving to reflect the underlying coal seam. This would count as a response to context but I doubt if it would command as much support as giving Moore an honoured place in Castleford’s urban landscape. 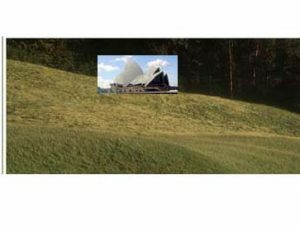 This entry was posted in context-sensitive design, Urban Design and tagged sculpture in the landscape on 6th September 2008 by Tom Turner. 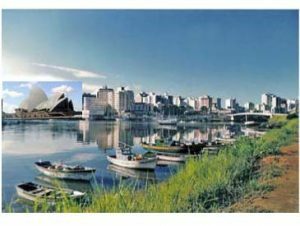 This entry was posted in context-sensitive design, Urban Design on 5th September 2008 by Tom Turner. 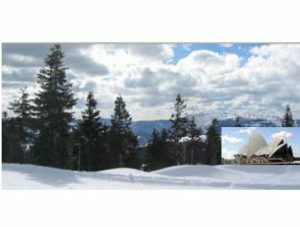 I agree that architecture and landscape architecture are applied arts. But in this, they do not differ from garment design, furniture design, etc. All should be functional and are best when they have high aesthetic quality. Sustainability considerations apply to each of these arts: if the world is running out of resources then we need to be more economical. 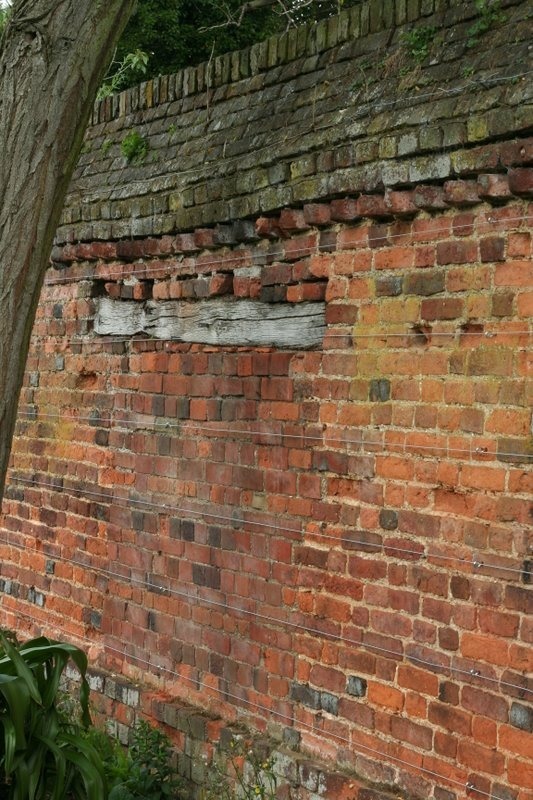 This is, amongst other things, an argument for using lime mortar instead of cement mortar. 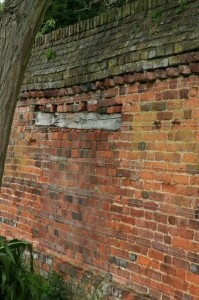 Lime bonded brickwork and stonework can be disassembled, allowing design changes the the reuse of materials. The public aspect of some applied arts raises other issues. The furniture in my home would seem to be entirely my own concern. But if I want to build a tall modern building in a medieval village then this becomes a matter of legitimate public concern. Ditto for the Martha Schwarz post-modern amhphitheatre in Castleford, especially because a bunch of idiots dipped their hands into the public purse to fund the park. ‘Meaning’ is another issue. 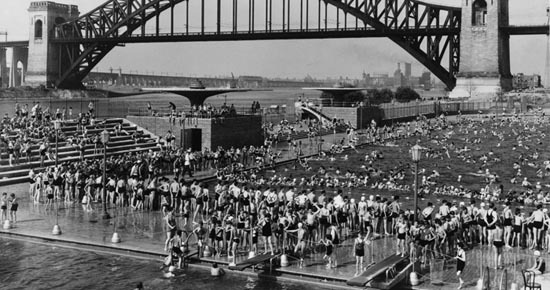 A modernist approach to the Castleford Park would have been to discover what people wanted for the space and then make provision for their activities. The postmodern approach, as used by Schwarz, was to give the space a ‘meaning’. I do not know what words she used – could it have been to ‘echo a Roman approach to open space design, as exemplified by the Colisseum’ – but they must have been something inappropriate. A post-Postmodern approach to the Castleford park would have involved recognition of the multifarious interests of local people combined with intelligent design leadership. Beliefs shared between the public and the designer would have facilitated their combination. Flying in a US Design Queen might have worked in the context of shared beliefs. This entry was posted in Book reviews, context-sensitive design, Historic garden restoration, Landscape Architecture, Public parks, Sustainable design, Urban Design and tagged architectural design, design theory, landscape design on 1st September 2008 by Tom Turner.